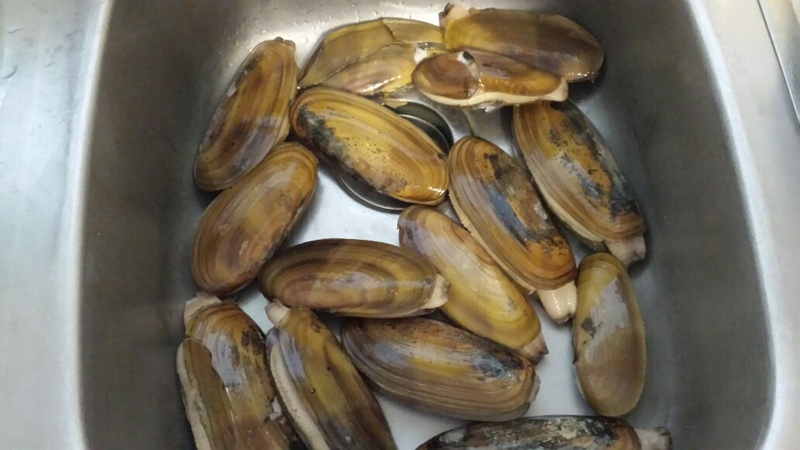 Pacific razor clams (Siliqua patula) are an exceptionally meaty shellfish which ranges from California to Alaska. It is abundant on surf-pounded ocean beaches, but also occurs in sheltered areas along the coast. 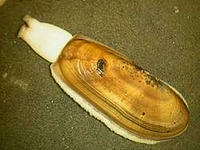 In Washington waters, these clams grow to a maximum length of six inches, although they are seldom found. Clams seven inches long have been recorded, but are very rare. The life expectancy for Washington is five years. Again, there are exceptions, but razor clams suffer from a high degree of mortality by Dungeness crabs, shore birds, numerous species of fish and of course thousands of clam diggers. A disease was also discovered in the early 1980's that caused mass mortalities of large numbers of clams. It is unknown how long this disease has affected populations. In contrast, razor clams found in Alaska may grow to eleven inches in length and live to be 15 years old, due to colder water temperatures and slower growth rates. 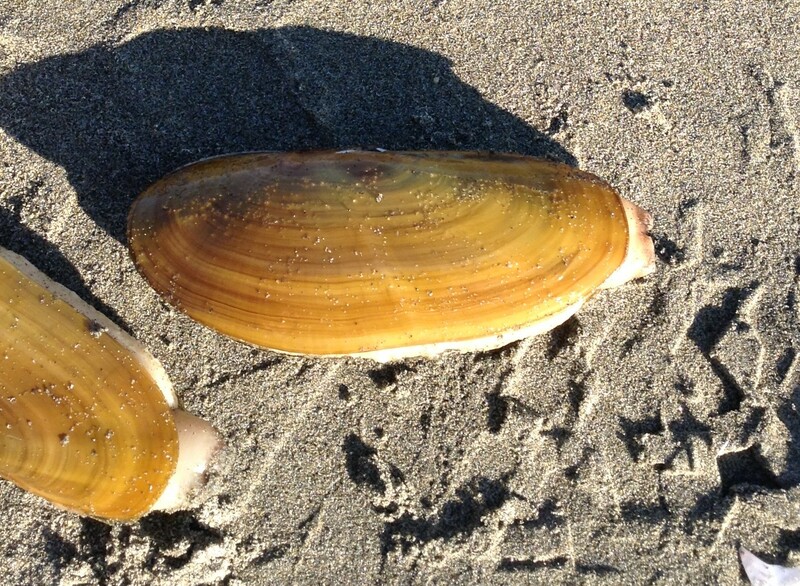 Razor clams are found primarily on the intertidal coastal beaches (those that are exposed at low tide) from a +3 foot level to a -2 foot tide level. Mocrocks from the Copalis River to the south boundary of the Quinault Indian Reservation. 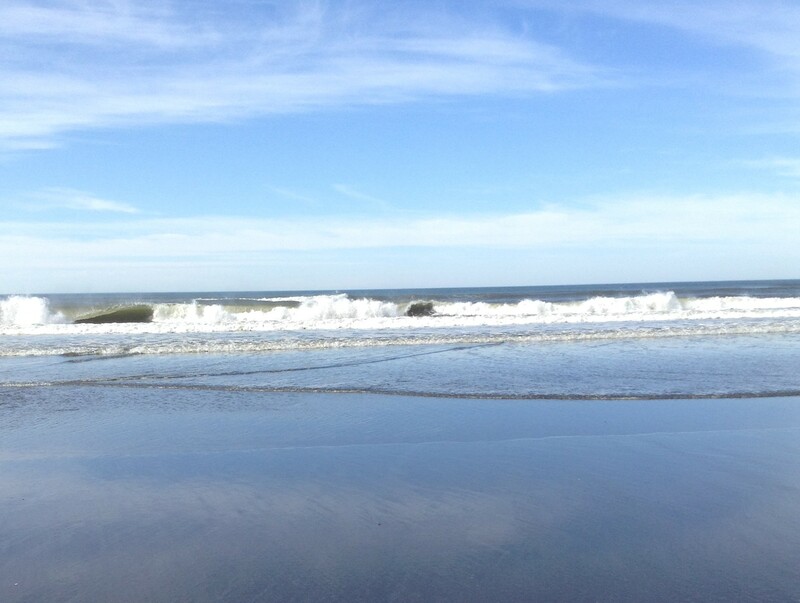 Copalis Beach from the north jetty at the mouth of Grays Harbor to the Copalis River. Kalaloch from the South Beach campground north to ONP Beach Trail 3. 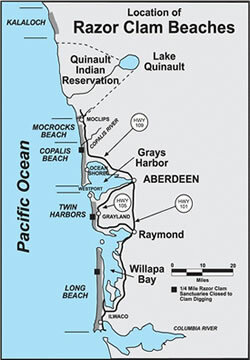 Other areas where clams exist are: a series of sand spits in the mouth of Willapa Bay, the Quinault Indian Reservation and numerous small beaches north of Olympic National Park (ONP) Trail 3 at Kalaloch. The sand spits in Willapa Bay are referred to as the Willapa Spits and are used for commercial harvest. 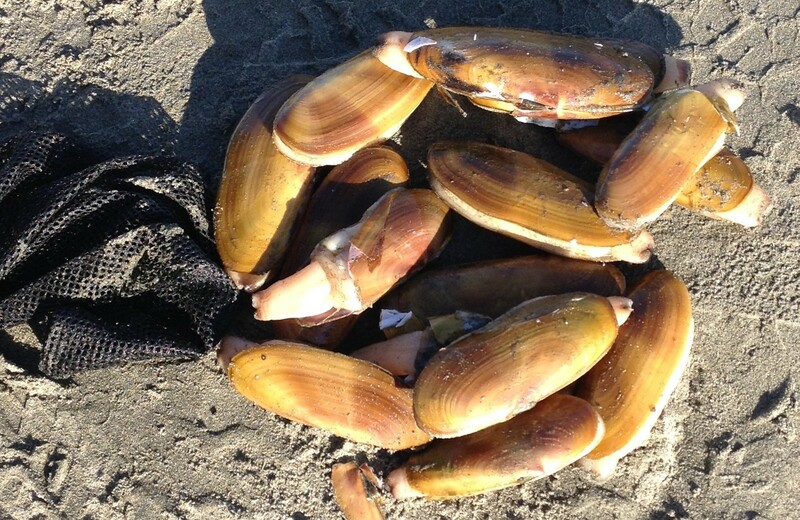 The Pacific razor clam is one of the most sought after shellfish in the state of Washington. Better roads and more leisure time have brought increasing numbers of diggers to the ocean beaches. 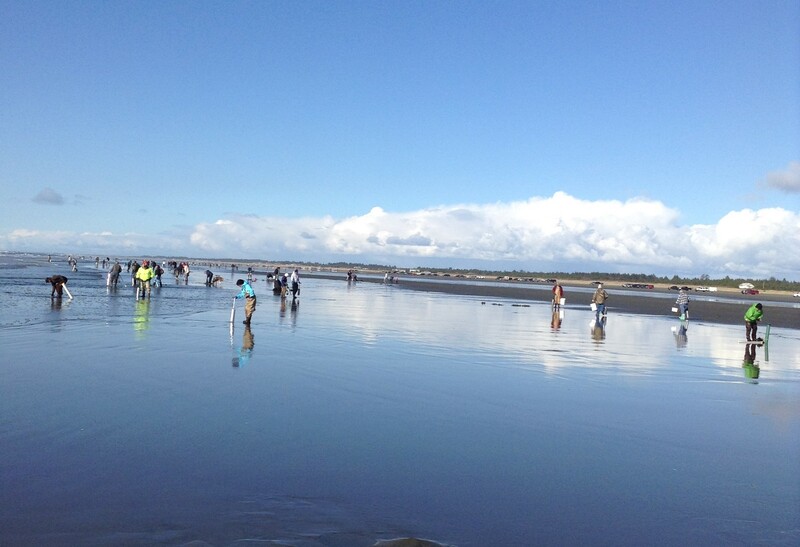 Crowds digging for razor clams. It is not unusual to have as many as a thousand people per mile during a nice spring weekend day. In past years, upwards of 300,000 individuals made 650,000 to 775,000 digger-trips to the ocean beaches and harvested 6 to 13 million razor clams. Since the mid-eighties, those numbers have been greatly reduced to only 250,000 digger trips harvesting 2.5 to 3 million clams. The reduction in the harvest was a direct result of decreased population levels, thought to be caused by historical over harvest and disease. 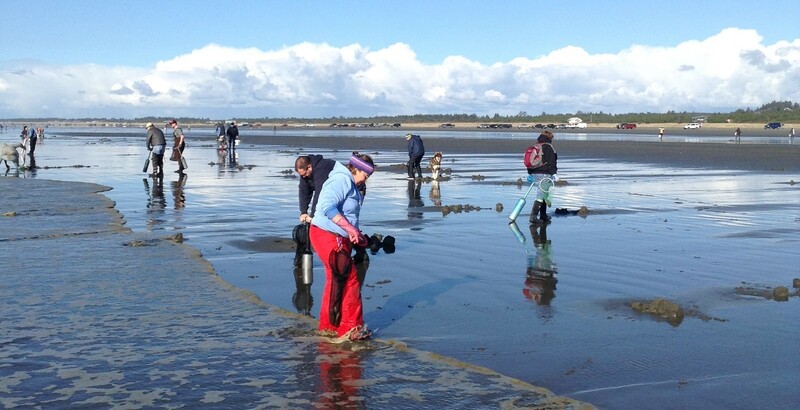 Recreational digging for razor clams is truly a family sport. It can be enjoyed by children and senior citizens alike. 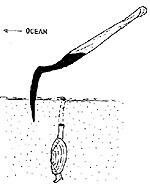 All you need is a clam shovel or specialized tube, a container to put your clams in and most important, your clam license. 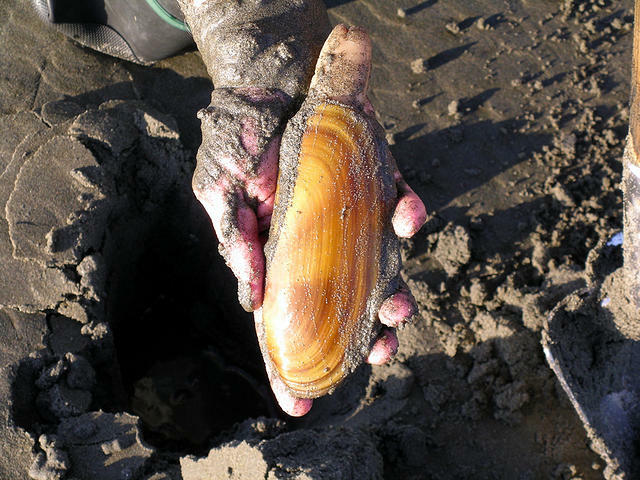 Be sure to check the Fishing in Washington Regulation Page for the latest regulation requirements for clam digging and other sport fishing regulation updates. Because there is a great deal of interest in digging at all times of the year, seasons are set to allow digging during daylight hours for spring tides when there is better weather. During the fall and winter low tides occur at night, when thousands of diggers brave the elements to dig by lantern or flash light. 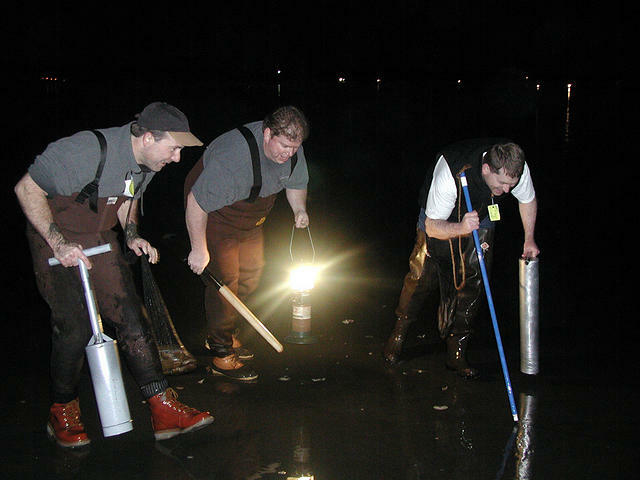 Razor Clam Digging at night. During the fall and winter low tides occur at night, when thousands of diggers brave the elements to dig by lantern or flash light. During certain times of the year, marine toxins, produced by some species of diatoms (algae) are taken in by the clams and concentrated. When ingested, these toxins can cause illness and in very high concentrations can be fatal to humans. 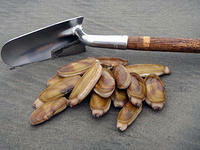 The WDFW in cooperation with the Washington Department of Health (DOH) sample razor clams on a routine basis. 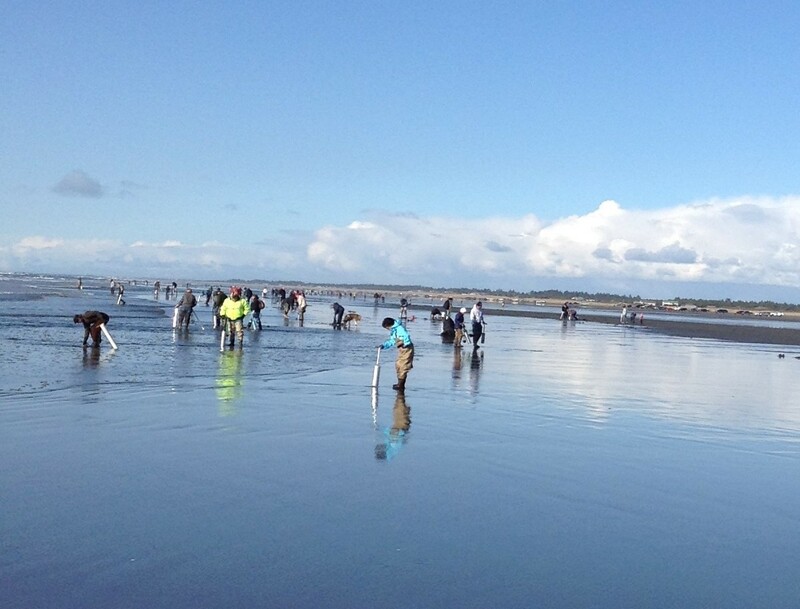 If high toxin levels are detected, razor clam seasons are delayed or closed. WDFW and DOH work very hard to provide a safe and fun resource to enjoy.